"Did get a call from a good friend who told us that the Meadville Job would be arriving Olean about 1PM, so we headed west to intercept it. First shot was at Vincennes, NY and the rest at Olean, NY. 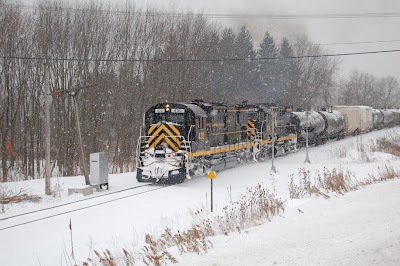 Sure was nice to see a matched set of ALCO's with a re-painted C-430 in the lead." The following news article from the Associated Press was found on the FOXNews.com web site. I hope all our readers always remember to STOP, LOOK, and LISTEN at all railroad crossings, especially those with no lights, bells, or gates. A car crashed into a train that was carrying mostly children to a visit with Santa Claus, killing two people in the car. No one was injured among the 67 passengers Saturday on the "Santa Express" train, which was traveling from Mount Pleasant to Clare, about 16 miles away, where Santa was to join the group, authorities said. Isabella County Sheriff Leo Mioduszewski said investigators don't yet know how fast the car was going. It struck part of the train's engine, which was hauling three cars, he said. The train's passengers were in the rear car, he said. The crash happened at a railroad crossing north of Mount Pleasant. Authorities said the crossing has a stop sign and a railroad crossing sign to warn drivers, but no warning lights. The Isabella County sheriff's department said the 31-year-old woman driving the car and one of her passengers were killed. Another passenger was hospitalized with broken bones. near Manville, NJ on a rather brisk and windy morning of December 15th. 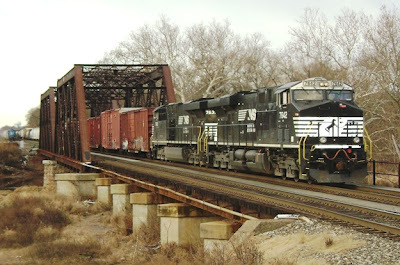 NS 212 @ 7:55- had NS 8990 (C40-9W), NS 2541 (SD70) and NS 9083 (C40-9W) for power on a train that consisted of autoracks, a majority of them being KCS and BNSF, some TOFCs and one doublestack bringing up the rear. 212 would hold on the passing siding at CP Bound Brook for NS 21M to go west on the main. NS 21M @ 8:05- headed west with NS 9175, NS 9758 (C40-9W) and NS 9955 (C40-9W) for power. NS 18G @ 8:54- would have two ES40DCs for power, NS 7642 and NS 7635. NS mixed freight, symbol unknown @ 9:00- would have NS 9831 (D9-40CW) and NS 2723 (SD70M-2) coming off the passing siding at at CP Port Reading Jct . It would take sixty-one cars of mixed freight west after NS 18G passed by. 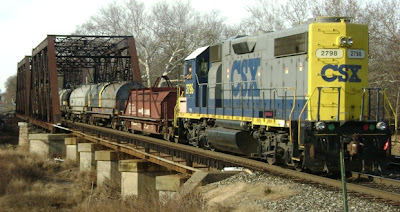 CSX MA80 @ 10:07 would have CSX 2798 (GP38-2, ex-CR 8238) taking eleven coil cars east. The ex-CR coil car behind CSX 2798 looks to be of a newer design than the traditional coil car. A photo is included for the modelers in the audience. We know of 2 different Santa Trains being run on New Jersey Transit. 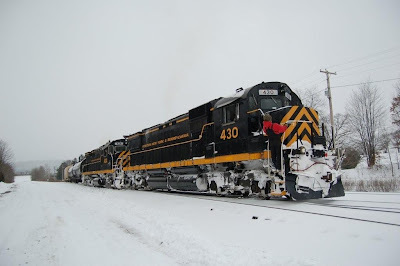 One on Saturday, 12/8/07 on the Raritan Valley line and one on Saturday, 12/15/07 on the Hackettstown-Netcong-Dover line. 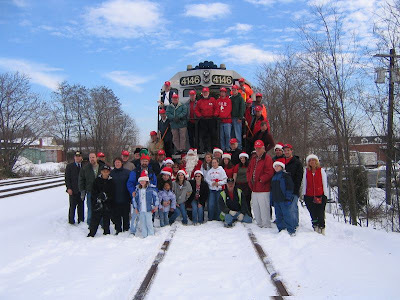 Join Santa, Mrs. Claus, and their elves for a train ride through the country. This trip features Santa Claus and Mrs. Claus along with a few of Santa's helpers. There are sing-a-longs, candy canes and coloring books for the kids. In addition, each car on the train features a drawing for a trainset; that's ten train sets per trip! Santa pays a visit to each car and is more than happy to pose for pictures with the kids. The Raritain Valley train departs Raritan at 8:30 AM and goes to Westfield where it will depart at 9:00 AM for the trip to High Bridge. This train will then return to Westfield, stopping at Raritan along the way. A second trip will depart Westfield at 1:00 PM, travel to High Bridge and return to Westfield. The price for the trip is $10.00 for children under 12 yrs. and $12.00 per adult. Tickets for the Raritain Valley trains may be purchased from The Big Little Railroad Shop. Cash or personal check made out to the Jersey Central Railroad Historical Society. Sorry, no credit cards for train tickets. Schedule and pricing are slightly different than the Raritan Valley train. We do not have tickets for this train. Received the following Press Release via email. UNION, NJ – The Model Railroad Club, Inc., a tax-exempt public charity affiliated with the Union County, NJ Department of Parks and Recreation, today announced the dates for its 2007 Annual Light and Sound Show and Open House. The show will run November 23, 24, 25 & 30 and December 1, 2, 7, 8 & 9 at the club building, located on Jefferson Avenue, off Route 22 east in Union, New Jersey behind The Home Depot. Show times are: Friday, November 23, noon to 10 pm; Friday, November 30 & Friday, December 7, 7 to 10 pm; Saturdays 10 am to 8 pm and Sundays 11 am to 6 pm. The show features the Club’s world-famous 1,600 square foot HO Scale layout. A 30 by 27 foot, double-decked N Scale layout is also featured. Visitors will also be able to view the progress that has been made on the 60 by 80 foot HO Scale layout addition. The show is a perennial favorite with children and adults alike. It is the club’s major fund raising event for the year and proceeds from admission donations and purchases made at the Club’s gift shop and snack shop will help fund the Club’s activities. New for 2007 is an additional presentation called “Classic Streamliners on Parade.” Exact HO scale replicas of five famous streamlined passenger trains from the post-World War II era, from locomotives to observation cars, will be on hand and operating. The Model Railroad Club, Inc. was founded in 1949 in the basement of the late Paul Mallery, a pioneer of the hobby of model railroading. The Club occupies a building on Union County parkland designed, built and maintained entirely by the members, under a unique arrangement with the Union County Park System. Free parking is available on site and the building is wheelchair accessible. For more information, please contact the Club at (908) 964-9724 on Saturdays between 1 – 5 pm or (908) 964-8808 for a recorded message, or by visiting the Club’s website at: http://www.tmrci.org/. .....and pick a destination. There's sound. were greeted with cold temperatures and a blustry wind heading east over the Lehigh Line near Manville, NJ on this Saturday morning. Their trip east was "... in a holding pattern due to a Chessie move..." at Port Reading Jct. That CSX train was Q409-30 headed south down the Trenton Line at 7:40. Q409-30's motive power was CSX 5375 (ES44DC), CSX 8858 (SD40-2, ex-CR 6502), CSX 7604 (C40-8) and CSX 7357 (C40-8W, ex-CR 6192). NS 214 finally was on the move again around 7:50. 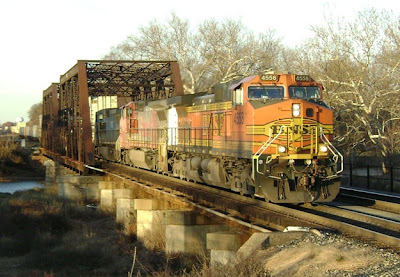 Its power was BNSF 4558 (C44-9W), BNSF 841 (C40-8W, still in a red and silver paint scheme with the "Fe" missing in Santa Fe) and NS 8463 (C40-8W, ex-LMS 723). NS 212 would follow shortly there after around 8:00. 212's all western power trio consisted of TFM 1616 (SD70MAC), UP 4176 (C44-9W) and UP 4149 (SD70M). 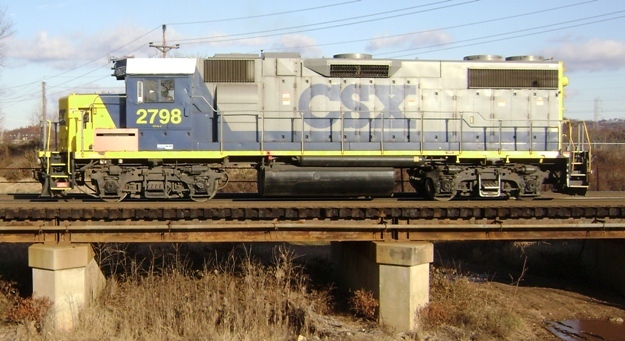 CSX's MA80 would be holding at CP Bound Brook before heading to Plainfield. 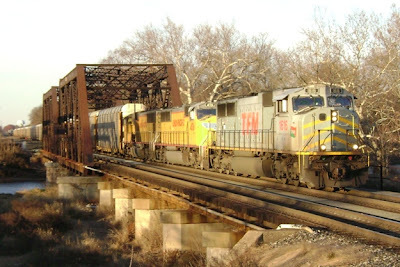 The power to pick up those cars would be CSX 2798 (GP38-2, ex-CR 8238). 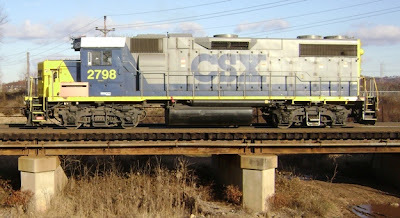 A side shot of CSX 2798 for the modelers in the audience has been included for reference purposes.